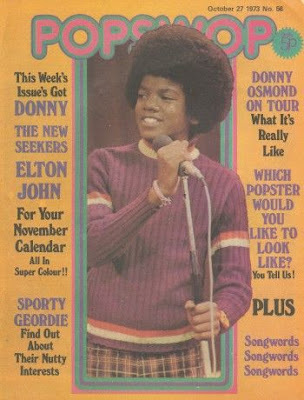 1973 - Popswop magazine[UK] featured Michael on their cover. 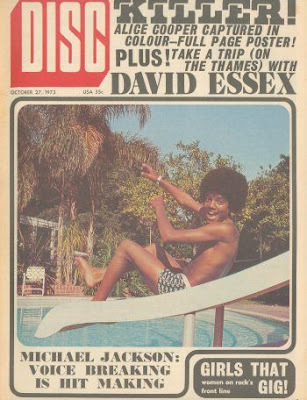 Disc magazine[UK] featured Michael on their cover with the story Michael Jackson: Voice Breaking is Hit Making. 1979 - The Jacksons perform Destiny tour in Buffalo, New York[US]. 1993 - Michael meets the President of Mexico. 1996 - Michael performs HIStory concert at Merdeka Stadium in Kuala Lumpur, Malaysia attending 30,000. Performances of "Black Or White", "Earth Song", "Heal the World", and "HIStory" either were not broadcast. The available broadcast go up to "Dangerous". Snippets of the October 29 concert (including the aforementioned songs) were also released during a news report on TV1000. Because crotch grabbing is considered impure in Islam, Jackson altered his crotch-grabbing move in this concert. Televised by ntv7. 2003 - The edited version of the single, What More Can I Give?, featuring a host of other artists, is released via the official Music for Giving website as a $2 download to support charity projects. The charities that received donations when "What More Can I Give" was donated were "Oneness", "Mr. Holland’s Opus Foundation" and "The International Child Art Foundation". It was due to certain legal delays and misunderstandings that the charity anthem, (also previously devoted to the Kosovo victims and intended to be performed with late Luciano Pavarotti in 1999), was redirected – via Internet pay - to providing financial aid to the September 11, 2001 victims in New York. Michael Jackson premiered the short film for his latest charity single titled, What More Can I Give? at Casino in Las Vegas, Nevada. The short film was first premiered to a small Clear Channel audience. Clear Channel is a collection of media and entertainment companies. Michael thanked the disc jockeys, producers, and radio in general and stated that he did not think that they get enough credit. He went on to say that they help artists get their music out and he wouldn’t be here without their support. During the video premiere, Michael sat on the floor and watched with the audience. He invited the children in the audience to sit with him. Immediately following, Michael went next door where the short film premiered again for a larger audience of radio stations. Again, he sat on the floor for the premiere. He thanked everyone and was extremely personable. Michael said that he feels his music is channeled from God; he sings it, but it’s the radio that gets it out. He expressed his appreciation again for the continued support of his work. Following the premiere of the short film Michael went back to the ‘Art of Music’ store and did another signing. Some fans were able to get in and get tee shirts, and other memorabilia signed. He also made sure to greet the fans that were standing outside of the store. In regards to this charity single, Michael simply stated, "Let’s make this happen!" In the evening, Michael Jackson premieres the short film for What More Can I Give in the conference area at the Aladdin Hotel in Las Vegas, Nevada. At the Radio Music Awards, Michael accepts the first ever Humanitarian Award from Beyonce. Michael enters wearing a black satin shirt & velvet pants with two belts, One silver and the other one silver and sparkly with matching sparkly shin guards and boots. *the crowd is standing, yelling, clapping* Michael embraces Beyonce and moves center stage. Smiling the entire time. *cut to enthusiastic crowd, applauding vigorously* Michael bows graciously and laughs. On accepting the Award, he draws focus to What More Can I Give, the sequel of the 1985 high-grossing charitable single, "We Are The World", and remembers the 2001 terrorist attacks in New York which, apart from their tragic aftermath, also "brought us together and finally brought this project together"; afterwards, Michael Jackson presents a short film showcasing the highlights of the charitable song’s recording. "We Are The World" was a project we did to help feed people around the Globe, who were starving and at risk. As you know, it was a huge success "We Are The World". This time, the time is come for the sequel to "We Are The World", to express our feelings, inspires, hope and lift those who need it most. It has been two years - a very long time – but with over one hundred people participating and donating their perecords, this project together finally has arrived. It couldn’t have happened without you all. The incredible talented artists who participated in creating this song that I just wrote. Two years ago, we survived a terrorist attack that forever changed not only our country, but the entire world. We will never forget that that terrible tragedy brought us together and finally brought this project together. Producing this song was a miracle in itself. Here is a video showing some of the highlights of the moving collaboration, and tonight, you will experience it here first. Thank you to Radio Music Awards for giving us this opportunity to bring it to the world. I hope, once again, we can set aut on a mission to lead the world in a path of harmony, by asking ourselves every day: "What More Can I give?" [the footage of the song recordings are displayed]; Jackson is given the Humanitarian Award by singer Beyonce, for which he adds a brief "thank you" speech." 2005 - Michael’s lawyer Brent Ayscough confirms that Michael has filed a counter suit against Marc Schaffel , accusing him of concealing and misappropriating funds and he has also settled a lawsuit filed by an antiques dealer who alleged he had not fully paid for $380,000 worth of goods. While in Barhain, Michael coordinates the recording of FTBOMH in Los Angeles with artists such as R Kelly. The O'Jays, Snoop Dogg, Ciara, Shirley Caesar, James Ingram et Babyface. He also renames the song I Have A Dream. 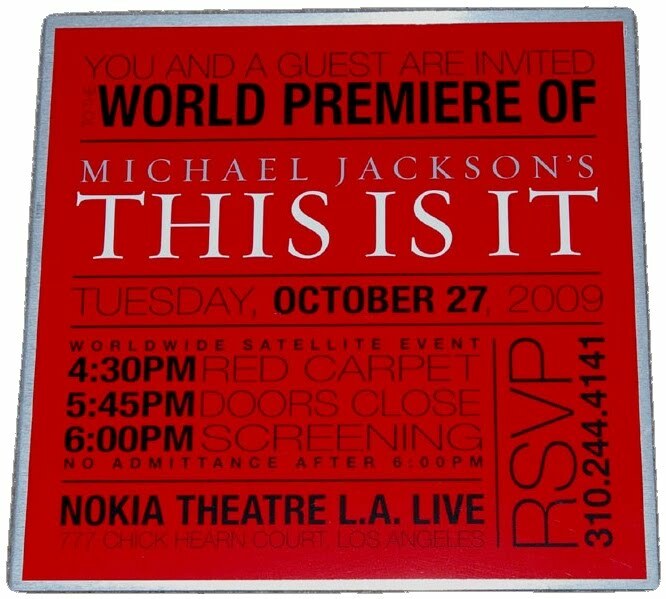 2009 - Michael Jackson's This Is It made its worldwide premiere at the Nokia Theater in downtown Los Angeles on Tuesday before it hits the theaters. The red carpet for the premiere was live streamed via webcast across the world, starting at 4:30 PM PDT. It seemed everyone in Hollywood wanted to see what This Is It was all about. Going on speculation and a glowing review from Elizabeth Taylor, a heaping spoonful of A-listers and others packed Los Angeles' Nokia Theatre for the premiere of the Michael Jackson concert film, comprising footage as he prepared for a 50-date farewell-concert blowout. 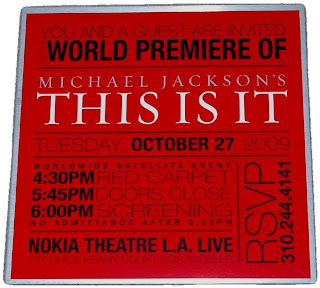 "I'm sitting in the nokia theater in awe of the 'this is it' movie!" twittered Paula Abdul, just one of the stars who walked the red carpet before showtime. "So many emotions are coming up For me I can't believe He's Gone BRILLIANT." Jackson's brothers were the blood-relative VIPs in a crowd that also included Will Smith, Jennifer Lopez, Katy Perry, Adam Lambert, David Cook, Paris Hilton, Neil Patrick Harris, Jennifer Love Hewitt, Nigel Lythgoe and Berry Gordy Jr.
"Michael would have loved this turnout," associate producer and tour choreographer Travis Payne told the L.A. Times' Pop & Hiss blog as Jackson's music played in the background. "It's time to celebrate Michael, to rejoice in all his wonderful messages of peace and love. People are going to enjoy seeing the Michael I always got to see." "You see him onstage as if he were standing in front of a full house," added This Is It director Kenny Ortega. "I hope the fans find satisfaction, that fans will understand what Michael had planned for them." Sony Pictures paid $60 million for the rights to more than 100 hours of rehearsal footage that was whittled into the 111-minute film. Its planned two-week run was extended because it's a major hit, but in the meantime it's opening in 99 countries by tomorrow and will expand to 110 this weekend. This entry was posted on 27 October 2010 at Wednesday, October 27, 2010 and is filed under 1973, 1979, 1993, 1996, 2003, 2005, 2009 . You can follow any responses to this entry through the comments feed .